Blu-ray Review: Romeo + Juliet; Moulin Rouge! Having had the sheer pleasure of pouring over Twentieth Century Fox's recent high definition upgrades of the second and third installment in Baz Luhrmann's theatricality themed “Red Curtain Trilogy,” I must admit that it was a bit disappointing that Disney didn't offer – if not a Blu-ray than at least a Combo Pack – of Luhrmann's debut, Australian breakout hit that started it all. Nonetheless, the Cannes Film Festival award-winner Strictly Ballroom continues to dazzle regardless of format, thanks to a fascinating, candid, in-depth making-of featurette included 2010's Special Edition offering of the 1992 crossover smash that offers viewers extra insight into Luhrmann's at-times way-too-over-the-top style. For although his no-holds-barred cinematic technique alienated this reviewer to the point that the first time I tried to see it, I actually walked out within the first ten minutes of Luhrmann's headache inducing Shakespeare adaptation Romeo + Juliet , the first and third movies in his Red Curtain series are undoubtedly his most effective and most personal. While Strictly Ballroom is easily Luhrmann's most accessible and straightforward feature, the book-ends of the Red Curtain , with this first dance and the final one evidenced in his wondrous epic Moulin Rouge! naturally benefit from the director's own background as a ballroom dancer who developed a passion for the art of performance and spectacle as a young man. Bearing more than just a topical similarity to the two theatre related Curtain sequels that would follow, Ballroom introduces us to Luhrmann’s fascination telling an old love story in a new way in his tales of like-minded, artistically and intellectually linked but socially unconventional would-be lovers. Yet the romance between two Shakespearean star-cross’d teens and Moulin ’s courtesan and penniless writer resulted in a tragedy in the two near rock-operas that completed his Curtain. However, affairs of the heart are given a Hollywood friendly happy ending in Ballroom’s David and Goliath celebration of the attraction between two dedicated dancers who literally live on opposite sides of the tracks. Benignly predictable, Luhrmann makes a narrative we’ve seen hundreds of times before incredibly appealing in his feature filmmaking debut, dressing up an extraordinarily simple script with outrageous music, costuming and production design so that the comfort food he’s serving us is suddenly transformed into an exotic meal. And while the style isn’t as pronounced as it would be in his subsequent films, the result is at once both tongue-in-cheek as well as intentionally exaggerated. Luhrmann’s eye-popping visuals and unusual edits nearly serve as a drum-roll, applause, or a laugh-track by calling attention to the absurdity of coincidences in his modern day plot mash-up of fairy tales in addition to his embrace of character clichés like the ugly duckling who just needs to ditch the glasses and the ponytail to become Ballroom’s lovely Cinderella. Even though, Luhrmann starts on the wrong beat by beginning Ballroom as though it’s a Christopher Guest inspired mock-documentary set after a crucial opening plot-point, once he ditches that framing device altogether and makes the changeover to a straightforward chronological storyline, the movie finds its footing rather nicely. Although he’s been classically trained since he was a child, Scott Hastings (Paul Mercurio) unintentionally horrifies his stage mother, strict coach, diva partner and an old-fashioned judge by improvising his own freewheeling footwork at the Pan-Pacific Grand Prix Dancing Championship. Told he’s disgraced the sacred tradition of ballroom dancing – having been jilted by his longtime partner -- Scott has no choice but to find a replacement with mere weeks to prepare until the next competition. Eager to fill the heels left behind, earnest amateur Fran (Tara Morice) bravely corners Scott, urging him to try her out even though she’s only been taking lessons for two years and is always left pairing up with another odd-girl-out at his family’s dance studio. Yet despite the fact that Scott’s understandably dubious at first regarding the potential of the sweet but far-less-glamorous Fran, he’s soon surprised to discover that she’s as creative as he is, ambitiously inserting her own new steps in the same old standard routines that Scott could perform in his sleep. Naturally, a romance soon blossoms but refreshingly, Luhrmann doesn’t jump at the chance to make his own version of Dirty Dancing , even going so far as to admit that he reworked one revision of his original stage-play because it was far too similar to the Patrick Swayze/Jennifer Grey crowd-pleaser. 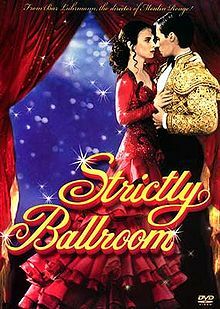 For although Strictly Ballroom is at its heart, a love story, first and foremost, it’s a story about the love of dance and how a shared love for the art-form brings together two people that wouldn’t normally pair up. And in a sentiment that not only became Luhrmann’s company motto but also became a thematic through-line for the remaining Curtain pictures, Scott and Fran bond over the idea that “a life lived in fear is a life half lived,” thereby inspiring each other to “dance from the heart” to let their footwork tell the story of love. 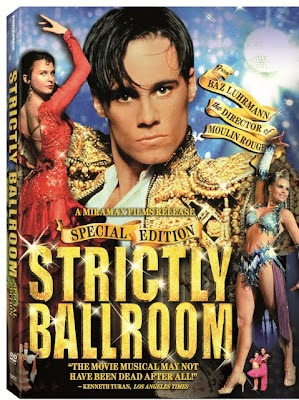 Still supremely entertaining roughly two decades later, Ballroom’s timely release right after Fox unveiled high definition editions of his second and third works is a welcome one for dance enthusiasts and Luhrmann devotees. Likewise, it serves as a thrilling reminder of just how enthralling and effective the filmmaker can be when he’s focused and enthusiastic about one concrete idea rather than letting his passion for play get the best of him in the unfortunately campy, excessive Romeo and Australia , since this rhythm is bound to get you.